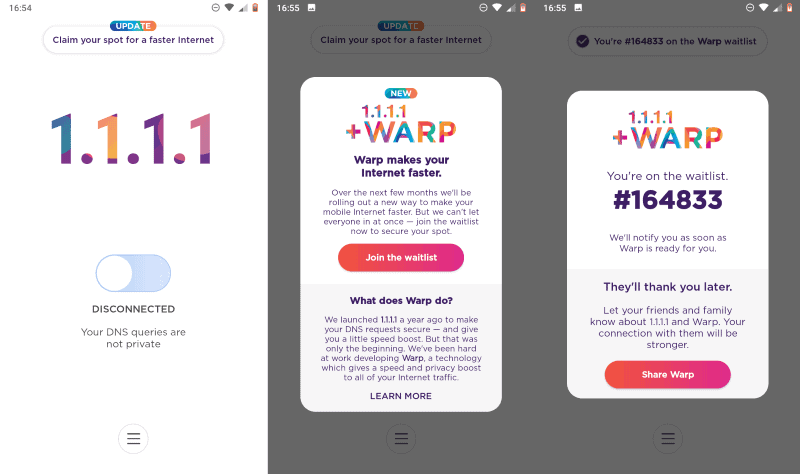 Cloudflare's VPN, named Warp, has been added to their 1.1.1.1 DNS service in celebration of the services 1st birthday. They launched the app on April 1st, 2018. The date fits the name, as the DNS uses four ones, and the date was 4/1. 1.1.1.1 was made to help increase internet speeds and add more security to your internet traffic. The added VPN now adds more to that with encryption straight from your device. It also works to reduce data use by caching and compressing content. They aim to make Warp one of the most reliable and fastest VPNs available, all for free. It also uses WireGuard, which is a solution to help minimize battery drain from using a VPN. It uses Cloudflare's Argo technology to make connections faster and more reliable. The service will also "Cache and compress content" to make loading speeds even faster. Cloudflare has always emphisized that it does not log and track your browsing history, cookies, or content before sending it to your device. They try to make 1.1.1.1 a fast, secure, privacy focused DNS resolver, and the addition of Warp makes that even easier for Cloudflare to do. Cloudflare is also going to release Warp+, a subscription version of the service for a "low monthly fee." The service will allow greater speeds and more reliability than the free version of the service. Warp is going to arrive in a free update to the 1.1.1.1 mobile app soon, but right now it is in beta. You can sign up for the wait list in the app now if you want to reserve your spot in the Beta program. Cloudflare also announced the desktop versions of it's DNS resolver with Warp built in are also "Coming Soon." You can grab the 1.1.1.1 Android app here, and the iOS version here.